On the occasion of closing the exhibition called The Organisers of Life. De Stijl, the Polish Avant-garde and Design, you are invited to the last guided tour in the exhibition and the Neoplastic Room performed by Paulina Kurc-Maj and Anna Saciuk-Gąsowska! Dancing Mondrian is a dance performance addressing the relationship between Piet Mondrian's neo-plastic paintings and the movement. The idea for this unusual combination came as a result of the very interests of the artist himself. The famous creator of abstract, analytical and seemingly "cool" compositions was fascinated by the atmosphere of New York - a place where dance and boogie-woogie music reigned in the 1940s. "I came across reports which reveal that the artist himself loved to dance, although he did it in a rather specific way," says Aleksandra Kozańska-Jóźwiak, a dancer and choreographer. "I imagined Mondrian, who, between his work on subsequent paintings, lets himself be seduced by ecstatic rhythms and gives a crazy dance performance. I decided to analyse his abstract geometrical compositions from a corporal and a dance perspective, reflecting on their mutual conditioning". The performance will be an attempt to create a movement language that would refer to Mondrian’s creative process, as well as his theoretical work. "In the music and movement that seduced Mondrian, I saw a potential which would lead to going beyond the idea of neo-plasticism, which was something that seemed gradually to start manifesting itself in the later works of the artist," says Kozańska-Jóźwiak. 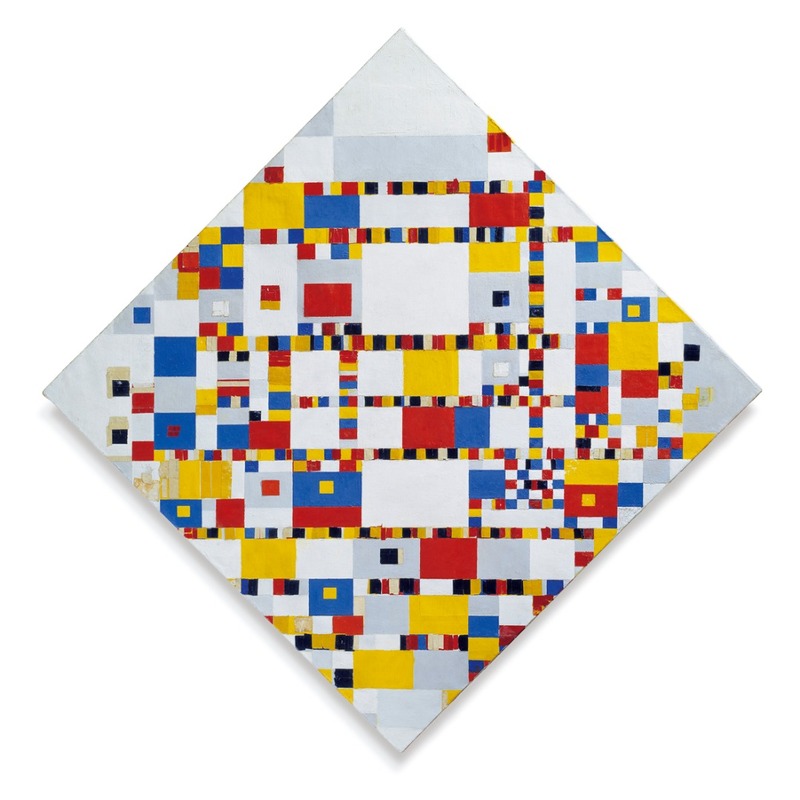 The goal of the performance is not only to examine the relationship between Mondrian's art and dance, but also to “complete" the incomplete Victory Boogie Woogie painting, which was being painted just before the artist's death. Aleksandra Kozańska-Jóźwiak is a dancer, choreographer and dance teacher specialising in jazz and contemporary dance techniques. She studied at the High Ballet School of Feliks Parnell in Łódź, currently completing specialist studies in choreography at the Academy of Music in Łódź. For many years she danced in the Harnam Folk Dance Group, and then in the jazz dance ensemble Teatr Domu Tańca (Dance House Theatre). She studied jazz at Off Jazz Centre in Nice, Harmonic Studio in Paris, Pineapple Dance Studio in London. In 2010, she set up her own dance band JazzinŁódź, with which she worked on and prepared two full-length dance performances and produced many smaller forms that have been presented at various festivals and competitions. In 2015, for the choreography of "Corpo" she was awarded a double prize – one at the Festival of Dance Theatres in Kielce, and the other in the competition of The International Jazz Open Festival in Pardubice. She is a graduate of English Philology at the University of Lodz. She works as a jazz dance teacher at the Non-public Ballet School in Lodz.